The new Protimeter Surveymaster in the third generation of this successful dual purpose moisture meter. With its pin probes and non-invasive scan mode users can quickly and accurately determine the levels of moisture present. The right moisture meter makes all the difference! And Protimeter have made many improvements to enhance the all new third generation Protimeter Surveymaster. This versatile pin and non-invasive meter is ergonomically designed for easy one-handed operation enabling the measurement of moisture in buildings and other related structures both on and below the surface. This allows you to assess moisture levels for new or refurbishing activities and diagnose moisture-related problems in existing buildings. 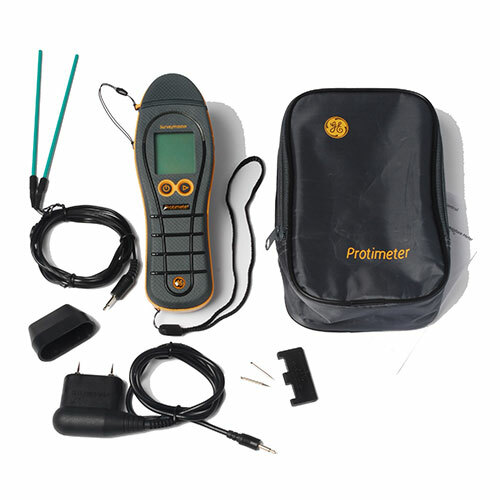 The Protimeter Surveymaster features in-built pin probes which allow you to quickly and accurately measure the moisture in various materials. Calibrated for wood the results are given on the WME (wood moisture equivalent) scale which allows you to measure accurately the conditions of other materials such as plaster & brickwork. 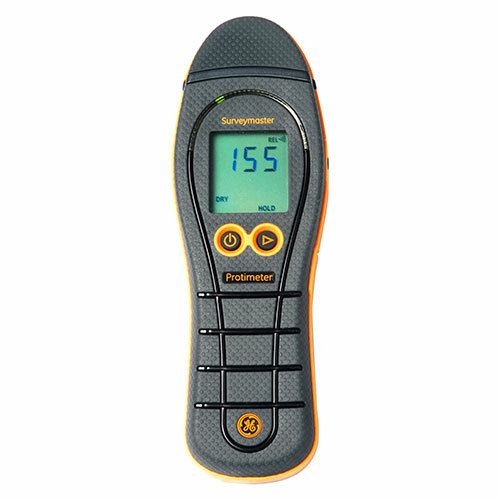 This professional moisture meter features an industry leading non-invasive mode which allows you to check the relative moisture condition over large areas without the need to make holes with the pin probes. This mode measures sub surface moisture between 1-3cm beneath the surface so is also well suited to users who wish to test beneath finished surface such as tiles you to search for sub surface moisture problems behind finished surfaces such as tiles where the use of pin probes is not possible. By combining the features of both the pin & non-invasive modes you use the Surveymaster as a quick check for the presence of condensations. With condensation you would expect higher levels of moisture on the surface which can be determined with the pin-probes and lower moisture as you go deeper in the wall shown via the non-invasive sub-surface mode. This patent pending feature allows you to measure and record the moisture in one area. Subsequent measurements will show the actual moisture level and the difference between in and the original reference reading allowing you easily to track the difference as you move over an area.